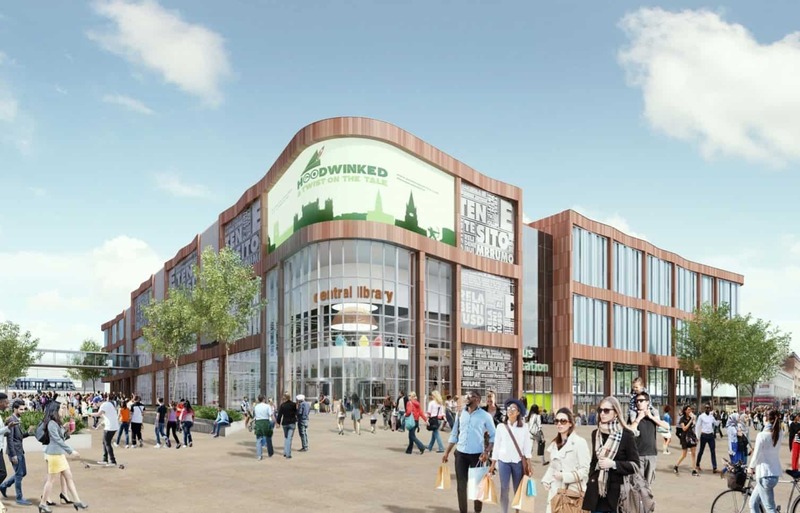 Nottingham City Council have approved the final designs for the new Broadmarsh development which will include a new Central Library for the city. The new Broadmarsh development, and the Central Library within, will be located in Nottinghams new ‘Southern Gateway’ project. This wider development will see the south side of the city transformed to include new offices for HMRC, a new hub for Nottingham College along with multiple other smaller projects and significant road layout changes. Leonard Design were responsible for the massing of the Broadmarsh building and the design of the library within. With a wealth of knowledge working on international projects Leonard Design have been very excited to work on a project so close to home. Just over one-hundred metres from the company head-quarters to be exact. The new library is an exciting change to the original design, re-locating the current city library from Angel Row to a new-built scheme when a lot of libraries around the country are shutting down. The original design included multiple retail units which have now been removed for the library along with a planned cycle hub. However alternate well-lit secure cycle provisions have been agreed elsewhere within the scheme. “The new library in this location has the potential to benefit the regeneration of Carrington Street and Southside generally, positioned on the strong north-south pedestrian route from the historic core to Nottingham Station and close to the proposed new Nottingham College.